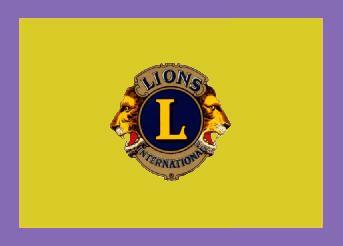 A white flag, with a yellow border, 3 x 5 dimensions (sold as 3 feet x 5 feet), bearing the Lions emblem. Other flags are shown on the same web page as shown below. 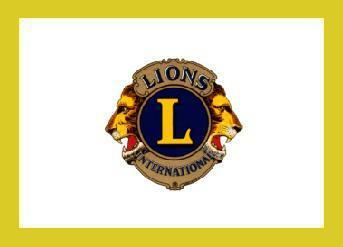 The various flags are used by the International Association of Lions Clubs. The indoor flag is shown in yellow, and allegedly there are other colors as well, according to the accompanying information. I myself have only seen it in yellow and blue, however. The second flag, the outdoor flag, is shown in white. I have only ever seen this flag in blue myself, but I don't doubt that it exists in this color since that's the color the Supplies Department of Lions Clubs International is selling it. 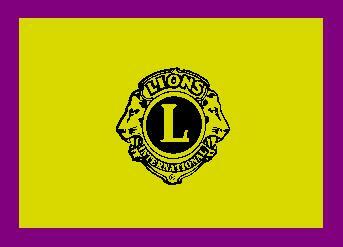 The International Association of Lions Clubs has used a standard flag since the 1920s. 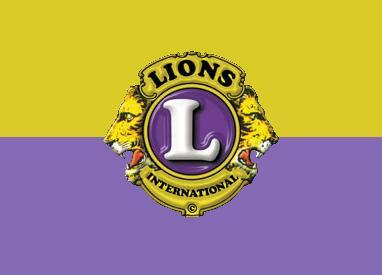 This flag consists of the Lions Logo on either a purple (sometimes blue violet or dark blue) or a gold background. As far as individual clubs are concerned, most clubs do not use formal flags but rather bannerets, akin to the German Wimpel. These are small banners generally hung vertically rather than flown horizontally, and feature the Lions logo, the name of the club, and its Region, District, and Multiple District (these can vary from country to country - some countries include Zones or eliminate Regions), and some aspect or feature of the particular community in which the club is located, such as a coat of arms, a local landmark, the image of a distinguished person who came from the community, or something similar. Additionally, senior Lions Officials such as District Governors, Chairs of Multiple District councils, International Directors, and International Cabinet Officers and Presidents, all have their own bannerets. Bannerets are exchanged when a member of one club visits another club (usually on holiday), or when a senior officer visits a club in either an official capacity or as a guest. The flags below are examples of Lions Club flags in use in Villa Adelina (San Isidro district), Buenos Aires province (Argentina).